A good day on the jobsite is a day without surprises. The full crew shows up — on time. 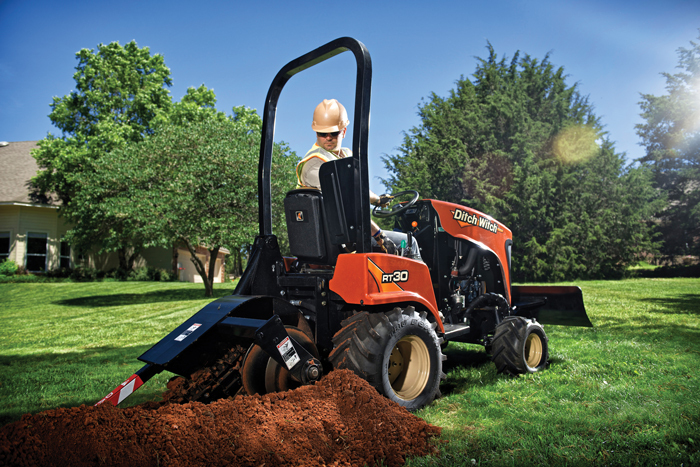 The weather cooperates, and all the equipment — including that nimble workhorse, the compact ride-on trencher — runs like well-oiled machinery. Why? Because its operator or owner understood the importance of planned maintenance. With their carbide steel teeth and reinforced steel frames, today’s trenchers are powerful earthmovers and dependable performers, designed to provide many years of service. But the punishments of rugged terrain, rocky soils and harsh working conditions take a toll. Bottom line: No machinery can continue to run well without care and maintenance. When a trencher or any piece of underground construction equipment grinds to a halt, the culprit is usually deferred maintenance. In today’s economy, more equipment owners are keeping equipment in service as long as they can. To extend equipment life and keep trencher units operating efficiently, there’s simply no substitute for timely and consistent maintenance. It’s also the single best way to avoid costly major repairs. And it all starts with a maintenance mindset. That means replacing wishful thinking — “Well, the trencher hasn’t broken down yet” — with a more pragmatic and proactive attitude. 1. Reading through your operator manual, and referring to it often. 2. Getting to know your local dealer — a great source of practical help. 3. Checking trencher fluids regularly, including engine oil, coolant and hydraulic fluid, and lubricating all service points. 4. Packing a service kit. If you know you won’t have access to spare parts and tools in the field, packing a service kit in your trunk or truck bed could prevent an emergency. Service kits are available to cover initial service requirements or a broader range of maintenance needs for more extended equipment use. • Cup Teeth are designed for dirt to compacted soil, also work well in soft, medium and sticky soils such as clay. • Shark Teeth or Rock teeth are designed for hard ground conditions including rock. • Carbide insert bits are another option for frozen ground and rocky soil. Even a short length of trench can contain several soil types. For best results in mixed soil conditions, use a combination chain with both cup teeth and carbide bits. By matching the right trench teeth to the job, and making sure they are not dull or worn, will help avoid overworking the trencher or power unit, which can extend the life of your hydraulic unit. Change fluids and filters (pictured) at prescribed intervals (more frequently when operating in adverse or dusty conditions), lubricate all service points and keep your hydraulic fluid topped off. The three highest-wear parts on chain-type trenchers are the chain, teeth and sprockets, and the more difficult the soil conditions, the more often they must be replaced. Always replace sprockets and chain at the same time. This optimizes life and prevents premature wear to the new component. Operating a trencher when these parts are worn or damaged can greatly reduce digging efficiency. It also places extra stress on the machine, causing unnecessary wear and possible damage to other components at the same time. The solution? Daily inspections. By being watchful — and knowing the signs — operators can stay ahead of wear and prevent many breakdowns. Inspection takes just a few minutes and soon becomes a regular habit. 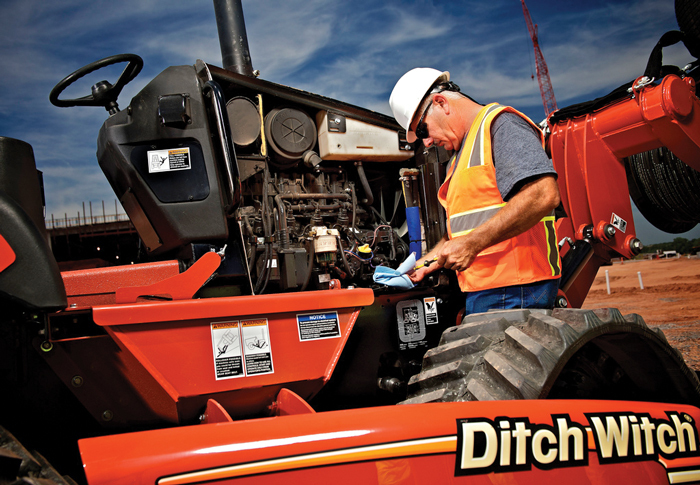 At a minimum, inspect digging teeth and the chain daily, or after each job — and check your trencher’s engine oil and coolant levels on a regular basis. When a digging chain is worn or incorrectly tensioned, it doesn’t run smoothly. Sprockets with incorrect or no mud relief will cause chain stretch when dirt becomes trapped in the chain’s roller links. A sure sign of chain roller wear is it beginning to take on the shape of an “hour glass.” The more pronounced this hour glass shape becomes, the closer you are to having the sprocket teeth wear through the roller, damaging or breaking the pins that connect chain links leading to chain failure. Improperly tensioned chains may slip off the sprockets, causing you to have to stop and reinstall the chain cutting into your efficiency and profitability. After every 10 hours of use, inspect the digging chain and roller links for wear and proper tension or degree of chain sag. Generally, the chain sag, or distance between the bottom of the boom (in horizontal position) to the chain should be from 1.5 to 2 in. Consult your operator’s manual for the correct tension. Be sure to avoid over-tightening the chain, which can cause the chain to stretch and potentially can cause premature chain failure. If using rock or insert style bits, check that bits rotate freely. Clean chain and check bits after each use. Replace bit when carbide cap or insert is worn or adapter can be damaged. When a new chain is installed, replace sprockets as well. Using a worn chain with new sprockets causes premature sprocket wear. Teeth can wear prematurely or unevenly. Worn digging teeth put unnecessary stress on the digging chain, which in turn taxes the engine and compromises productivity. Worn teeth are like chopping wood with a dull axe. This creates shock load that can be transmitted to other areas of the machine. Worn teeth are also less productive. Think of digging teeth as shovels that carry dirt out of a trench. The more the cup has been worn away, the less dirt it can carry out. Inspect the teeth every 10 hours of machine operation. When replacing dull teeth, maintain the original tooth pattern, which will give you maximum efficiency. For more efficient digging, ask your dealer to recommend the best tooth pattern for your particular job. When digging teeth are worn, it’s also time to inspect the sprockets. And if sprockets need replacing, it’s also time to replace the chain. Running a new chain on worn sprockets causes excessive chain wear and can result in chain failure. Operating an engine for long hours with the incorrect level of engine oil and coolant levels can cause involuntary downtime. To avoid this, check your trencher’s engine oil and coolant levels on a regular basis, adding the correct fluids as necessary. You can also change fluids and filters at prescribed intervals (more frequently when operating in adverse or dusty conditions), lubricate all service points and keep your hydraulic fluid topped off. For a busy trencher owner or operator, it’s tempting to put off planned maintenance — especially with today’s compressed project schedules and extreme budget pressures. But that’s exactly why the maintenance mindset is so critical. Developing the proactive habit of routine and planned maintenance is the single best way to ensure high-performance trenching. A well-maintained trencher makes every trenching project more efficient and more profitable — while delivering a higher resale value. It’s all about having more good days on the job — and fewer unwanted surprises. Steve Seabolt is a product manager with the Ditch Witch organization, based in Perry, Okla. Thanks for sharing this important information about TRENCHER operator, This Guide Really Very Helpful for Trencher machine operator, They Needs to read this info. Great Post Keep Sharing.